It felt like a cruel, reoccurring joke; like he just couldn’t catch a break. Wyatt Mazour, a 5-foot-9, 200 pound, running back from Albion, Nebraska, redshirted his first season in Lincoln in 2015. He chose to walk on at Nebraska over schools like Iowa State, North Dakota State and Drake. “I got to my dream school,” he says, but doing so required debt. He jokes that he’s broke. The glamorous life of a Power Five football player isn’t so glamorous when you have to pay for everything out of pocket. When the 2016 season rolled around, Mazour didn’t see the field in the opener but played against Wyoming in Week 2. In a practice after, he collided with linebacker Josh Banderas. Helmet to helmet. Season over. Mazour went into the concussion protocol. He missed the rest of the year. Mazour wasn’t in team meetings, he wasn’t in film studies, he wasn’t on the practice field. Nothing. “I wasn’t around football for two months,” he said. The first practice he was able to attend wasn’t until December when the Huskers were prepping for the Foster Farms Bowl. He missed class, too. Three weeks of it. A year of playing catch-up. “It was tough,” he said thinking back on it. His sophomore season began with promise. 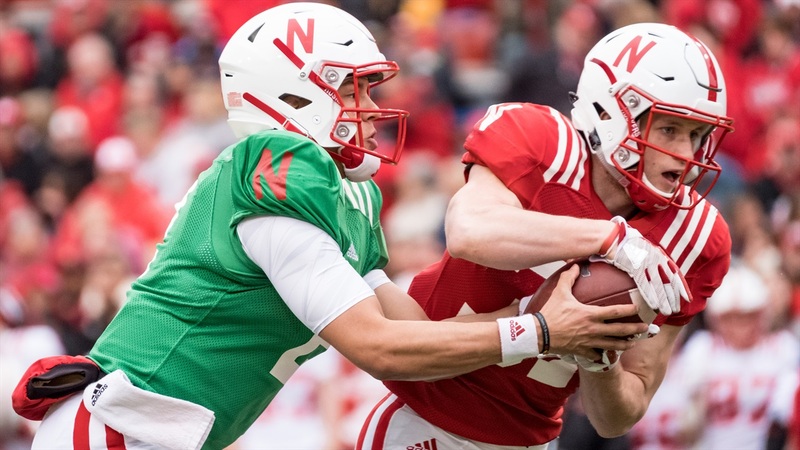 A 29-yard carry, a touchdown and a 14.3 yards per touch average in the annual Red-White Game on April 15 made the local walk-on a fan favorite at Walk-On U. A week before the season-opener against Arkansas State, Mazour pulled his quad. Out for five weeks. More catch-up. He didn’t see the field until Oct. 28 against Purdue, then played in three of the final five games but never touched the ball. Three years in, a lot of frustration, not as much to show for it. When Scott Frost took over as the Huskers' head coach and the offense changed, Mazour felt like his best chance was in front of him. Adrian Killins, a 5-foot-8 Florida speedster for the Central Florida Knights had just run all over the field in Frost’s offense. Mazour fancied the versatility and the number of roles that could be filled by a guy with his exact skillset. Mazour is one of two guys who has filled the Duck-R position in the new offense, a hybrid weapon that’s half running back, half wideout. “I think it’s a perfect fit,” Mazour says. But a day before the team’s first scrimmage during fall camp, Mazour dislocated his shoulder diving for a loose ball. Last week was his first time as a full practice participant since, with a combination of rehab and a non-contact wardrobe in between. He missed all three of the team’s scrimmages. The thing about Mazour, though, is he doesn’t stay down for very long. Frost says he “epitomize[s] the walk-on program,” says there’s “hardly anybody on the team” that works harder than the back and says he sells out for Nebraska. Mazour attacked rehab; three hours a day, every day. He stuck to the plan. He kept in the playbook, kept mentally focused and when he was able to get back onto the field, he made the most of each rep. And there were plenty to be had. Despite loading the room upon arrival, Frost and Held, the team’s running back coach, have given Mazour a fair shake. Mazour has committed to special teams — “I’m on all of them,” he says, and he starts as an off-return man on kickoff return — and that’s about as important as anything with the new staff. Held says if you don’t play special teams, you’re not making it onto the bus. Two weeks into fall camp, Frost was asked about awarding his first walk-on player a scholarship. “Huh?” he asks his coach, who gets a big smirk on his face. Frost repeats himself, Mazour manages to get out, “Appreciate it, Coach,” and then goes back to team drills. There are two periods left. His mind starts racing. Practice ends and the team meets to break it down like normal. Frost gives the usual announcements and then asks Jacob Weinmaster, a junior linebacker, to stand up. “You earned a scholarship,” Frost says. The team goes even crazier. No more doubt, no more tough breaks, no more being broke. The positives find a home where the struggles used to reside. Mazour says Nebraska kids are slept on, they come up with a chip on their shoulder. This was what all the hard work was for. If there was ever any doubt, it's instantly replaced with validation. “Coming here, that’s what I’ve been working for,” Mazour said. “It’s truly an honor to be one of Coach Frost’s first walk-on scholarship guys. It means the world to me. Especially with all I’ve been through, just having to overcome a lot and just battling my way back. For him to do that, it meant everything. Now I’m going to work even harder. Mazour said he wants to leave a legacy at Nebraska. His ultimate goal wasn’t just to earn a scholarship (though being a Nebraska kid, it’s still pretty damn special) but to help the team win. There’s still work to be done on that front. “I’m very happy for Wyatt,” Held said. “He’s worked really hard for this program in all aspects. He’s represented the program the right way and is deserving of being awarded this scholarship. It shows that being a walk-on at Nebraska, you can earn a scholarship and potential playing time." Mazour said he expects to see the field a lot in 2018. There might even be a clearer path to doing so than in years past. Splitting time with the wideouts and tailbacks has given him more of a grasp on the details. “I’ve grown a lot as a player and as a student of the game this fall camp,” he says.